Lots of people in pedagogical scholarship talk about the benefits of collaborative learning for students in traditional classrooms(see section A5 in this list). But does it hold true for knitting? 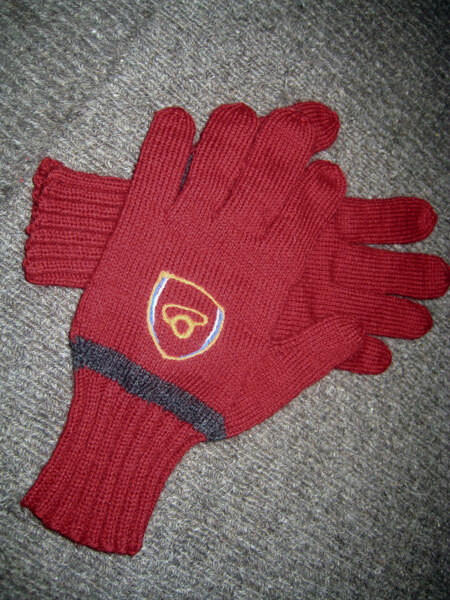 The gloves themselves weren’t collaborative, but the decorative accent (in this case, the Arsenal FC logo) was as collaborative as it gets. Initially, the plan was a combination of fair-isle and intarsia knitting to make these awesome goalie gloves for a die-hard Arsenal fan. That was clearly a bad plan, but I’m a knitter and I was so focused on how to do the logo and finger tracing with knitting that I overlooked the obvious: needle felting. It took a non-knitter to tell me that needle felting was a much better choice. 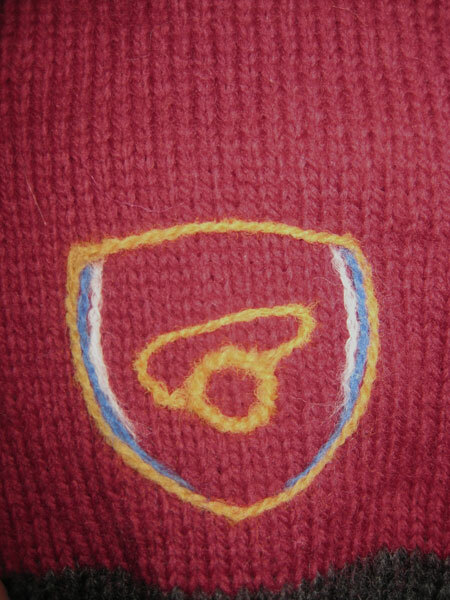 And a close-up of the logo for good measure. Ultimately, a time crunch got in the way of the finger tracings, but that’s probably a good thing because that would have taken a f**k-long time and I have little patience for such things anyway. Now let’s just hope the damn things fit. Making gloves on spec for an absentee friend sans proper measurements is a scary proposition. 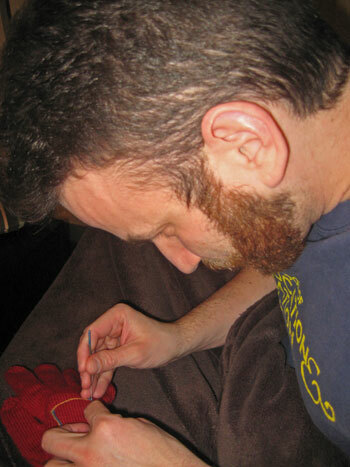 Edit, March 11, 2010: The gloves fit! They fit! There have long been links between smell and memory (a link which explains my long-standing aversion to Jaegermeister). My most recent knitting project has convinced me that my musical drive trumps smell any day when it comes to memory and recall. To wit: I have had “Linus and Lucy” stuck in my head all week. I will likewise probably always move my hands in funny ghostly-knitting motions whenever I hear “Linus and Lucy” from now on. Because of this…. 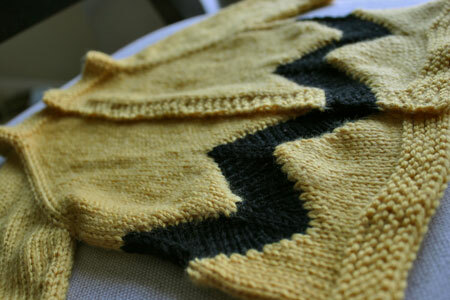 Commissioned to appropriately clothe a still-gestating bald-headed kid, this seamless raglan baby cardigan served another purpose in my knitting repertoire: how to avoid intarsia for basic colorwork shapes. Because there was no way in hell I was going to carry multiple strands for these stripes. So I did short rows instead, using increases and decreases in the black stripe to keep the fabric basically flat. There’s still a little bit of puckering going on. 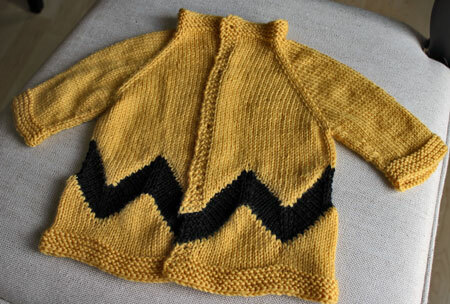 If I were to do this again (and I might in colors that don’t evoke Charlie Brown in quite so dramatic a way), I’d probably increase one extra stitch on either side of the increase and decrease lines within the black stripe. Still, it’s awfully cute. And jazzy. Right, so all of my writing mojo has been going here instead of, well, here. However, the last week has brought a few fun knitting-related things, two of them in print as of now. Second, a sweater that uses two totally different yarns to create texture, designed for Yahaira Ferreira’s Pure Knits book. It’s been almost 2 years since I designed this, and it was really satisfying to see the final product surrounded by so many beautiful patterns bound together into a single theme. I will be knitting the men’s herringbone hat-and-scarf set in this book in the next 3.5 seconds, and it will be mine, all mine! Next up? More academic writing, and some secret knitting that makes me want to stalk the product pages at Amazon until the link is live and I can finally post. The knitting has, in chemgrrl’s words, been of the ovary-exploding type. One of my bestestest friends in the whole wide world gifted us with a new variety of baby: the kind I like. 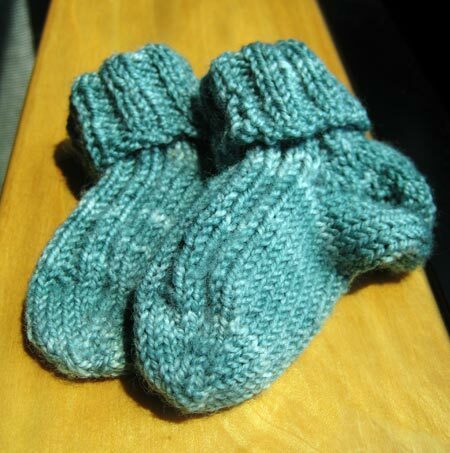 Of course, these tiny little booties (and an accompanying pair which I did not photograph) do not 3 months of knitting make…. No, indeed. There has also been knitting of other kinds. Which I can’t share. Yet. Instead, I offer up the second-best home-brew dye job in the world! Urban camouflage. Invisible or not? You decide. Really, “second best” is something worth saying with pride. Maybe third- or fourth- best, even, given the company at the TBKGE’s Second Annual Dyeing Party. Allbuttonedup has the best. Srsly. Haven’t seen photos yet, but I can guarantee that it was spectacular in person, and there were several other very pretty fibery things including a cotton-candy spectactular that Sara did (though the fleece on which the cotton-candy was unleashed unfortunately felted in the process). Who is apparently not so random after all. 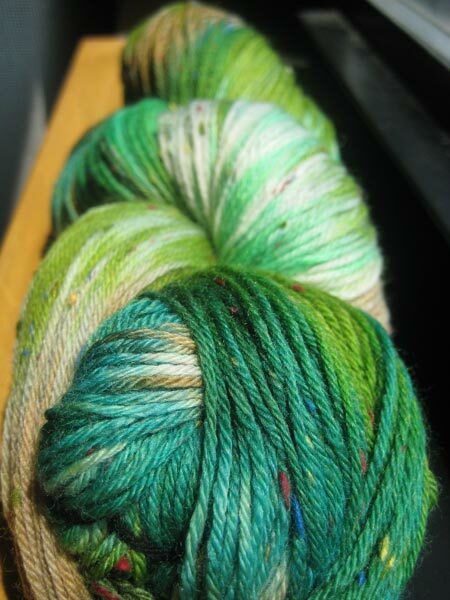 When last we checked in with our intrepid knitter–that would be me–she was…. Wait, hang on, I can’t talk about myself in the third person. I am not Bob Dole, nor am I Kanye, so, let’s reboot this post. When last I presented a work-in-progress on this blog, I was trying to randomize one part of my life–the socks–in order to derandomize some other parts (schoolwork, etc., with the “etc.” part being the parts that I don’t talk about much but think about quite a bit). The Randomized Socks are clearly now complete. Of course, the Randomized Socks are red, and therefore nigh-on impossible to actually photograph with any degree of accuracy, especially with my little Canon. (I opted not to pull out the big giant Canon because it’s heavy and kinda hard to aim at my feet while staying still enough to get a non-fuzzy photo.) Thus, even the photo of the socks is a little random, at best. Nevertheless, these socks are not random enough. I put them on and they look as though they’re the most planned cables in the world. Which is the problem I had with them initially, but I thought we’d gotten past that (we being “me and my many personalities, one of which is a multiple personality”). Clearly not. So, the question is: did the under-randomization of the socks result in an over-randomization of the other stuff? That’ll teach me to question entropy. There are lots of things my Mom did intentionally, to model proper behavior for my sister and I. Share! Be nice! Eat your cheesecake parallel to the crust! I’m not sure either of the following two things were intentionally done on her part as examples for my sister and I, but they sure stuck. When I was in seventh grade, my Mom got my sister and I a puppy. A tiny, squirming too-smart-for-her-own-good mutt who knew when it was a friend coming up the walk, effectively blocked a 250-lb repairman from coming near anyone in the family despite her less-than-imposing 7-lb weight and instantly became one of the family. Turns out D.J. was the model by which I now judge all dogs (and to be brutally honest, people), but it was a difficult adjustment to learn how to take care of her, to integrate her daily needs into our lives when we were just kids who wanted to go play. Right about the same time, my Mom brought home a “laptop.” A huge, hulk of a machine that weighed as much as I did, had a tiny 7″ orange-type screen and a detachable keyboard that formed part of the hard outer-shell case. It ran DOS and made sad little beeping noises when you accidentally typed “D:\” instead of “C:\” at the > prompt. She used it to create really complicated documents, muttering the whole time about “reveal codes” and how she always had to fix other people’s stupid formatting mistakes. But it had Q-Bert and that made putting up with her muttering and carting its bulk up and down the stairs to my room worthwhile. Turns out that big, giant hulk of a machine was the model by which I now judge technology. And–let’s also be brutally honest here–some people (especially the ones who make sad little beeping noises when you make tiny mistakes. Sadly, these people tend not to pass the dog-yardstick test or come with the redeeming Q-Bert install). Thankfully, the model the dog provided and the model the computer provided serve very different purposes. I know now that dogs and people often live up to the admittedly-high D.J. yardstick, but computers will forever outpace my ability to measure them. And I learned that we add things to our lives because, even if they complicate life in some unpredictable ways, our lives get better. Easier. Faster. More rewarding. I am who I am–a geek with a willingness to accept that things can’t stay the same forever and a great longing for both fountain pens and bleeding-edge technology–because my Mom brought home the dog and then the computer. Because Mom always questioned her environment and looked for the right thing to change. She got the fantastic dog who added so much responsibility and joy to our lives. She used reveal-codes when most people just selected text and pressed the “bold” key regardless of what might happen. That means Mom has the longest-running geek-grrl influence in my life, making her my Ada Lovelace Day/Women in Technology/Let’s Honor The World’s First Programmer role model, whether or not that’s what she intended. Instead of hanging back and staying in the typesetting field with which she was so familiar, she taught herself how to code and now runs Web sites. She is–and she will kill me for saying this–nearing retirement age, but instead of coasting and doing stuff that makes her comfortable, she pushes boundaries, tests herself. She’s learned HTML, CSS, and basic scripting in 2 different languages, all in the last 2 or 3 years, and mostly on her own, and that list doesn’t include all the things she’s taught herself beyond the scope of that 2-3 year timeline. Still, the most important thing I learned from her about technology is even more fundamental: she never uses technology solely for the sake of using technology, and she never sticks old methods solely for the sake of comfort. It’s easy to do both. Newspaper closures all over the country suggest how difficult it can be to break free of an old model, in much the same way that every failed new-new-thing product demonstrates how stupid it can be to do something bleeding-edge solely for the sake of doing something new. What I learned from my mom is that wisdom applied to technology is the real key. Changes in paradigm that use technology can, when they’re done right and for the right reasons, make life better. Easier. Faster. More rewarding. And let’s not forget: more fun…. I guess it’s been one of those weeks. You know, a week where everyone seems to have exactly the same week? Blogless Norma and I have been splitting the sleep allotment of a single person–and apparently, the same kind of obsessive behavior when it comes to combining coding and academic research–but that doesn’t really photograph well. 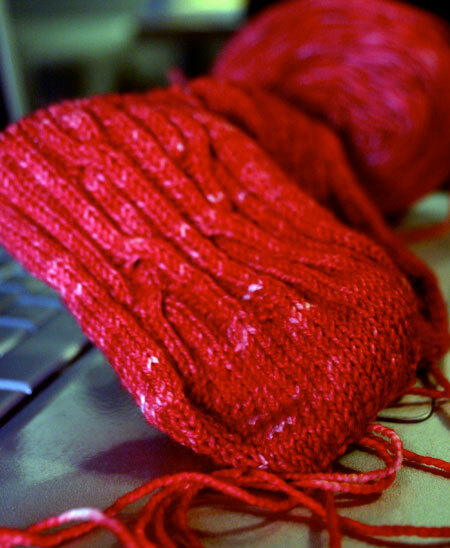 What does tend to photograph well is a confluence of knitting. 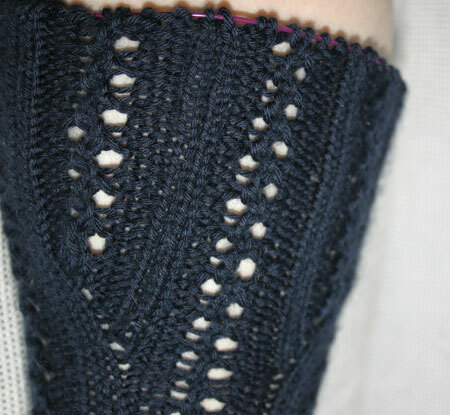 Chemgrrl has been working on a scrum-diddly-umscious pair of orange Sock-Hop knee socks for a few weeks, perhaps as long as I’ve been working on a much more boring pair of navy knee socks knit of Karabella Margrite (or something like it in sport weight, can’t remember, details TBA). She’s just been more diligent about documenting her work. No longer. No longer will these socks be hidden in the shadows of my procrastination, subject to the injustices of my slackerdom. But where’s the other sock? The only thing I’m worried about is whether or not I have enough yarn to make it just one more inch in pattern before I start ribbing, which should allow the socks to cover my ridiculously large lower-leg area. 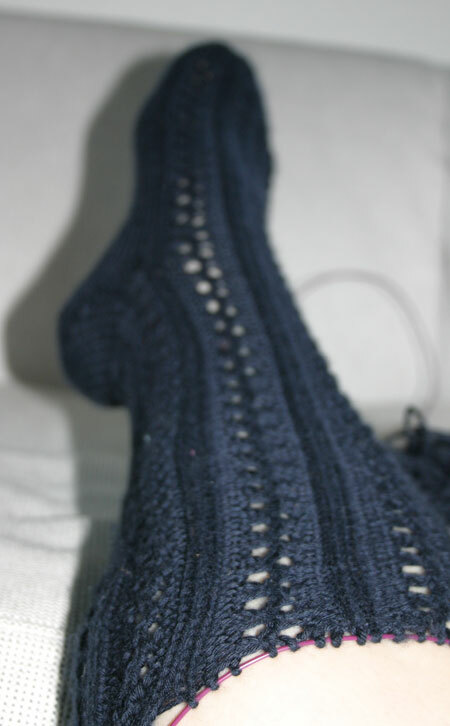 Like chemgrrl, I had to do some in-pattern increases to get the poor socks to fit. Unlike her, I’ll probably release a pattern at some point. Look at how planned that looks…. Not at all as though I winged it. Wung it? And, like chemgrrl, I hope someday to name these after someone in my knitting group, because it’s The Best Knitting Group Ever ™. In high school, my physics teacher called it thermoGoddammits, not thermodynamics. And for good reason, because any isolated system will tend to become more disorderly over time, even with intervention. And if constant vigilance doesn’t have an effect, well, then that seems to me like a perfectly good reason to swear. Swearing also takes work. Effort. Involvement. And I have enough work-effort-involvement elsewhere in life right now, what with conferences, teaching, writing, researching and begging for cash to fund the aforementioned conferences, teaching, writing and researching. It takes lots of work–and swearing–to keep the isolated system I like to call “My Life” from spiraling completely into chaos, so I thought I’d try something different. I thought perhaps if I let entropy do its work on one part of the isolated system, as embodied by my current pair of WIP socks, I might be able to keep the rest of the system under control. Random! Disordered! Unplanned cables! Whee! This has turned out to be harder than I expected. Either I’m not random enough, or it really does take planned effort to make something look effortless. I’m not sure how to interpret this turn of events. If it takes effort to make something *look* as though it’s descending into an unplanned spiral of madly placed cables, does that mean I can just leave well enough alone in the rest of the “My Life” system and things will fall neatly and nicely into place? If so, the stupid second law of thermoGoddammits has it all wrong. I am very sorry I stared fixedly at your back for 10 minutes. I was reverse-engineering your sweater, not engaging in some sort of odd lovelorn behavior. Or perhaps, on second thought, I do have an unrequited crush on your knitwear. Either way, I’m not creepy. Really. I promise. It finally happened. My horrible sister and I were nice to each other for a week, and the day she was scheduled to leave, Indiana got 13 inches of snow. Which gave me just enough time to publish a new pattern perfect for this kind of weather: a quick-knit super-bulky hat and scarf pattern that will be done before the next snowstorm hits…. The Mistaken Identity Hat & Scarf was finished a few weeks ago, but I didn’t have it test-knit or verified until just a few days ago. But it’s done now, and just in time! Yay! Look, I’m serious for once!